Star Wars. Is there another science fiction universe in this world that has been so embraced by the masses, so despised by some, and adored by others? Most of all, though, has any other science fiction universe been so expanded after it was created, and not much of it by the creator’s hand? True, it might have been authorized by the man himself. But from what I have gathered in the 10 years since I saw the Star Wars original trilogy for the first time, it seems all additional fiction, comics, books, games, music -- all you can think of – has been created by other people. Even the huge Star Wars fan base has contributed: websites, special leagues and fan fiction have made this world unique. From this, everyone gains something. The man in the suit (in this case flannel shirts, George Lucas´ favourite clothing) gets the money from owning the whole circus, the creators receive money from their efforts (or respect from the fans if they are writing, e.g. fan fiction) and we, the fans...well, what could be better than just having to open your mouth and have candy fly into it? I would guess we are quite spoiled after all, even though we don’t think much of it. Now...I apologize for the long rant above (praise, depending on your point of view), but just before and at the moment I am writing this review, I have been reawakened to a wonderful phenomenon known as fan fiction. Yes, fanfiction.net may be largely populated by 12-year olds with a testosterone problem, but amongst this screeching horde of vulgarities and NC-17 stories, a courageous bunch of writers stand strong in this constant uphill battle. As a shining example of this, I encourage anyone interested in Knights of the Old Republic fan fiction to read the story “A Casualty of War”, which resides hidden on fanfiction.net. A direct link for you is http://www.fanfiction.net/s/2253453/1/. It seems I get carried away sometimes and keep prattling about things I shouldn’t, so back to business. One of the things that Star Wars has spawned since the early 90s and even before that is games. It started out as arcade games, simple blip-blop-avoid-the-clogs games, to be continued with first person shooter games such as Dark Forces and later on arcade games for the PC such as Rebel Assault. But never until Knights of the Old Republic (KotOR) did LucasArts attempt a role-playing game in a Star Wars environment (unless you count the sorry excuse of Yoda Stories, which I don’t). With KotOR we got exactly what we all wanted in a good RPG, except possibly a bit more size and more ways to reach an objective. Nevertheless, it was a classical, epic Good versus Evil saga, with numerous ways to interact with people, resulting in a change in your own character towards good or evil. It also had interesting characters, and together with the truly excellent story, (not one person I have spoken to was able to foresee the story’s huge twist), it formed a solid game. Maybe not one you play over and over again to see how different things can be, such as Fallout or Baldur´s Gate, but still something that kept your interest after you finished it. The game left you hungering for more of the same thing, and even if rumours say it was planned from the beginning, the demand of the fans certainly helped the development of a second game, released only a year after the first. This time, though, it was Obsidian Entertainment who held the strings and not Bioware. Still, even if I am fanatically loyal to Bioware, Obsidian has warded the legacy well, if not flawlessly. Knights of the Old Republic II: The Sith Lords starts out slightly more mystically than the first game. You are mortally wounded aboard a very familiar star ship, drifting in space. All Trask haters rejoice. You will not have to play through the Prologue every time you play the game. You may simply choose to skip it, though I recommend playing it the first time as it adds a few details to the story later on. However, after some adventures aboard your vessel, you wake up aboard the Peragus Mining facility, where something seems to have happened. There is no welcome committee, even though you are a most peculiar visitor and you should have attracted the attention of at least a doctor or nurse, shouldn’t you? In normal order, you travel through the mining facility, meeting up with other NPCs (I will not say friends, because it’s something of a vague expression) who will aid you in your quest. Ah, yes, the NPCs. As with the earlier game, you can converse with them about their (more often than not) dark past while making progress through the game. Something new about them now, though, is that each party member or NPC has a certain set of mind. Through different actions or conversations you can become more of an influence on them, which may result in some changes later on, which I will not spoil now. This is a refreshing change from the usual, and will force you to take more things into consideration than whether you want to just kill someone or be kind to him, to take a simple example. All characters seem to be at least as, or perhaps even more, fleshed out than the ones in KotOR. Everyone has their own story to tell, and they engage in conversations more than before, too, which is nice, as they don’t just stand around totally ignoring everything but you and your enemies. You cannot expect to get to know everyone’s life stories as you did in KotOR, though. First you will have to gain their trust, and that is where the influence system is applied, making them a bit more than just mentally dead meatbags (to quote a favourite character of mine). When they are together on your ship they also quite often interact with each other, making it feel like your own private pet house after a while, trying to keep track of people. The only drawback is that there are unfortunately too many loose ends (which I will return to later). At occasional points in the game, you will be able to take on the role of certain individual NPCs. This makes you redefine your way of playing, making the game a bit more varied than it would have been otherwise, and it is a nice way of distracting you from the other “path” your character is currently following. And with your lovely companions at your side, you stride through the galaxy, winning the love and respect of everyone and beating the evil villain in the end. Or do you? No matter which path you choose, I can assure you this will not be the case. Whereas the first game was the very typical Good versus Evil story, this is not at all the case here. A third KotOR is already in the works, and it is rumoured that they made it to be like the original film trilogy. The first as an opening, the second descending into darkness and the third the majestic resolution of it all, ending the saga. Meaning that in KotOR II, you do not play someone destined for greatness or glory, merely someone trying to make his way through an unforgiving galaxy and what it holds. It is not an easy task, seeing how things affect you and those around you, as well as the many interpretations of the world that can lead to all kinds of trouble. And to add to this, it is up to you to figure out who you are and what has happened in the world during your absence (this will be explained in the game). You have not suffered a memory loss or something as drastic, but throughout the game, the player him/herself gets to know who the main character is, as this is not explained in any kind of prologue. Frankly, I think it was a smart move, as you do not have it all staked out for you to follow. Much of this game is shrouded in debates about morality, the truth, and how we all see the world. If you like to engross yourself in deep thoughts, this is a game for you. I guarantee it will make you pause at least once to think about the world around us. However, managing to do this of course requires a decent control of your party members, and I can happily report that the old system is still in use, although it has been improved in many ways. For example, now everything in the inventory is divided into different categories, making it twice as easy selling and buying stuff as before. No more miniature searching for just that small but essential part you are looking for to make something work. Cheers to Obsidian for that. In fights, everything is the same as before; you fight, choose different types of attack, use force powers or items or throw grenades. All done smoothly, although the pathfinding when in battle leaves a bit to be desired (sometimes your characters just can’t seem to reach an opponent and then they just stand there instead). What is new here is the ability for you to choose between a number of different styles of fighting when using melee weapons, each of which works in a different way, making the combat more interesting. You do not know all of them to begin with, however, and have only the basic ones to start with. Still, it is a fun addition to a game with already engaging melee fights. No standing still, waiting for each round to end and then sluggishly swinging the sword again. Instead it is all that you could ever want; kicking, dodging, jumping, slashing, bashing and thrusting. As before, the fights are a beauty to watch, especially with lightsabers involved, their distinct sound making you almost dream yourself back to the fights in the movies. So, that is all well and good, but what about the graphics and sound? And with fights and spectacular shows, we are sweeping our eyes to the technical matters of the game. First off, the sound is, as could be expected from LucasArts, first-class. The blasters sound appropriate in a Star Wars universe, weapons swing through the air and make dull thuds when connecting to flesh, followed by agonizing groans. And as is usual, the lightsabers continue to emit their quite comforting, almost melodic sound. Nothing new on that front except the music, which is once again written and directed by Jeremy Soule. In KotOR, some people thought the music was a bit monotonous, but here, it ranges from mellow soft tunes in the background when walking amongst peaceful grassy hills on Dantooine to the bombastic, dark full-fledged orchestra music blaring at you in the final confrontation. The graphics in KotOR II, unfortunately, have not been kept up-to-date, and even if some small details have been improved (such as better textured faces -- now everyone doesn’t look as if they have a galactic twin), this area still falls short of what could be demanded. This is especially evident on Peragus, walking through long tunnels with the same concrete grey all over with hardly a change anywhere in that part of the game. Sometimes I even found myself thinking that the wall textures in the first game were better. Luckily, the details of characters and small features -- such as the interior of the Ebon Hawk -- helps relieve this, but it still feels as if it could have been done better. It is as if LucasArts was desperate to have this game out, so they pushed Obsidian too hard, and Obsidian was then forced to simplify the game slightly. This is most evident in certain parts of the subplots in the game. Characters start peculiar conversations or do things in cutscenes, which we never get an explanation for. Some parts of the game have been cut out completely due to the lack of time given the developers by LucasArts. Many scenes between party members interacting in the story itself have also been cut away, which is a terrible shame, because it leaves holes where the scenes should have been. Luckily, fans have acknowledged this. The reason this was discovered was because the sound files and scripts for these events could be found on the installation CDs, and a “Knights of the Old Republic 2 Restoration Project” is underway. This can be found at http://magestrix.com/K2End/about.html if you are interested in learning more about them and their progress. Another slight annoyance is that the game has something of a double nature. While it is a complicated story with twists and functions that seem to be drawing experienced players to it, many will be disappointed by how easy it is. If you are an experienced player, don’t even think about setting the difficulty level to “easy” or you will be bored to tears by how easily you mow through dozens of assailants while still not having reached a high level. Although the “hard” setting should appease most gamers, there are probably many who will still think of this as being too easy. Personally, I found it satisfying to play on the “normal” setting, sometimes turning it up, depending on the situation. The final, and – behind the story issues – drawback is how buggy this game is: characters not appearing, journal entries not being erased, journal entries not being updated, characters disappearing, cutscenes not appearing and the game crashing, to name a few. As I write this, however, a patch has already been released, which will make me challenge the game once again. Just do not try to run the game unpatched. So all in all, what do we have here? A sequel to the game many praised as the best game of 2003 and others praised as one of the best role-playing games ever. I will not go that far, but it is without doubt, along with Knights of the Old Republic the best Star Wars game to have been released (possible exception: Tie Fighter). Due to their exciting game play, deep stories and smooth design, Knights of the Old Republic and Knights of the Old Republic II: The Sith Lords are excellent examples of games that can be enjoyed by gamers outside the Star Wars circle of fans. They will probably appeal even to people who have not given a thought to the universe before now. Do not let the slightly mediocre graphics fool you into discarding the game. To the people who have played KotOR and liked it: you should definitely get KotOR II. I would recommend playing the first one before though, so you get a nice feeling inside when everything connects between them. 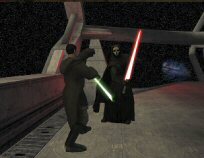 To the people who have played KotOR and didn’t like it: play it again and enjoy it. To the people who have played both games and liked neither of them: you are a lost cause. Go play Tie Fighter instead...the only Star Wars game that can stand up to this series. Myself...between reading fan fiction and eating, I am a much eager and willing apprentice to learn more about the dark side of the Sith Lords. An outstanding game that - despite the drawbacks - still manages to immerse you in its world and leave you hungering for more.